While compact system cameras are now on a par with DSLRs when it comes to image quality, it’s fair to say that traditionalists still prefer the look, feel and mechanics of a DSLR camera. Luckily, there’s lots of choice on the market, depending of course on what it is you’re looking for. Pretty much anybody who wants a DSLR, whether you’re a beginner, you’re at the high-end enthusiast or even professional end of the market, has an option available. It’s hard to choose an outright winner in this category of cameras because no two consumers are the same. An entry-level camera is going to be no use to a working professional, while a top-level model is complete overkill for the new user. That said, if you sit somewhere in the middle and want a fantastic all-rounder, the excellent Nikon D500 is a superb choice. Before you consider a DSLR, think about what it is you’re hoping to achieve with your photography. If you’ve been considering trading up from your compact camera or smartphone because you want to take things more seriously, going for an entry-level type DSLR will help you to develop your skills. If on the other hand you’ve already been using an entry-level camera for a while and are ready to the next step, the cameras at the enthusiast level are cameras you can grow with and produce some stunning results. Finally, if you’re looking for something that really does offer the ultimate in both image quality and usability, the professional level cameras available today are capable of remarkable things. For beginners, cameras like the Canon EOS 800D and the Nikon D5600 are a great balance between helping you get the best possible shots without having an overwhelming array of dials and buttons when you’re just starting out. If you’re an enthusiast and want something a bit more complicated to get your teeth into, both the Nikon D500 and the Canon EOS 7D Mark II are fantastic all-rounder cameras that can handle all manner of different subject matters. If you’re happy to divert from the “big two”, the Pentax KP is also great as a mid-range option and is full of appealing specifications. You only really get full-frame sensors if you head to professional territory. These ultra large sensors offer the best in image quality, while the cameras themselves are best for hands-on control. The best options in this area of the market are the Nikon D850, the Canon EOS 5D Mark IV and the Sony A99 II. The slow march against the DSLR from the mirrorless battalion has been held back by the marvellous D850. The camera which is doing more for DSLR sales than probably any other model at the moment, the D850 is a superb all-rounder for the professional who shoots a little bit of everything. Advanced enthusiasts will also get a kick out of how well it handles a variety of different subjects. 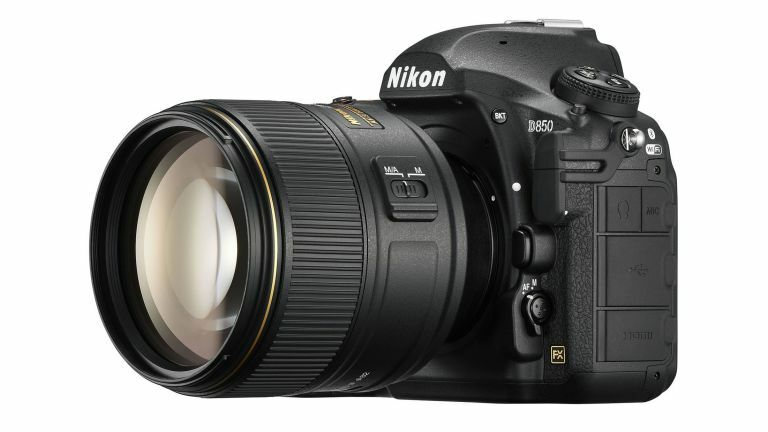 With a high-resolution 45.4 megapixel sensor, 4K video capture, a 3.2-inch tilting touchscreen, a 153-point / 99 cross-type AF system that pretty much just nails it every time, and a sturdy body, you’re unlikely to be disappointed with what the D850 can deliver. If you’re looking to trade up from an entry-level Canon model, the 7D Mark II could be the camera of your dreams. It’s a superb all-rounder which features a 20.2 megapixel sensor and a host of excellent features to suit a variety of needs. It’s great for wildlife, sports and action photography with its fast 10fps shooting speed, while other subjects such as portraits and landscapes are also ideally suited for it. The 65-point AF system does an excellent job too, while the body is sturdy, well-built and is great to use. On the downside, the screen is fixed and there’s no wi-fi built in. The latter is disappointing for both quick sharing of shots and for remotely controlling the camera. Quite probably the best APS-C DSLR currently available to buy on the market, this solidly built camera is the perfect choice for those who like to shoot a little bit of everything. It’s got a fast frame rate, which makes it ideal for sports, action and wildlife, while it can also handle landscapes, portraits and events with aplomb. It’s aimed primarily at advanced hobbyists, but it’s easily good enough to be used by professionals - especially as a second camera. It’s best if you can buy the camera with the 16-80mm kit lens, which is so much more than just your average kit optic, offering a wide f/2.8-4 maximum aperture range and producing high quality images. If you find yourself lusting after a D500, but don’t quite have the funds available, consider instead the D7500. It shares many of the same specifications as its older brother, including the same sensor and processor combination but with a few compromises to help keep the price lower. A chunky and nicely textured body makes the D7500 a nice camera to hold and use, with some modern touches like a fully articulating touch-screen to satisfy those used to smartphones and the like. The trade off for the lower price includes an autofocusing system that’s not quite on par with the D500, but still very good. You also don’t get the opportunity to shoot quite as fast, with 8fps available, but it’s still very useable for those who don’t shoot action every day. Canon updates its line of entry-level DSLRs fairly regularly, so you can almost always guarantee that the latest tech is available even for beginner models. The 800D (known as the T7i in the States) inherits some great specifications from those higher up in Canon’s line, including a snappy 45-point AF system. There’s also an excellent touch-sensitive articulating screen, a decent Live View performance, and, most importantly, high image quality. If you’re looking for a solidly built and well-rounded entry-level camera, the 800D is the ideal choice - if you’re looking to tighten the purse strings a little more, the 1300D is also a great beginner friendly option. The D5600 is an excellent option for your first DSLR, especially if your budget can stretch to investing in some additional lenses to go alongside the kit optic. One of the most interesting specifications of this camera is that it’s fitted with Snapbridge - that’s a low-powered always-on Bluetooth connection which automatically transfers your shots to your phone for instant sharing on Instagram etc. What could be better than impressing your friends with DSLR quality shots while on the go? Aside from bragging rights, you get a high-resolution 24 megapixel sensor, an articulating touch-sensitive screen and a 39-point AF system. It can be easy to forget about Pentax, despite it being one of the oldest camera names in the business. So while Nikon and Canon definitely dominate in this area, the K1 Mark II is a good, affordable alternative. For less than £2,000 you get something which offers great build quality, a high-resolution 36 megapixel sensor, and a high-performing shake-reduction system which helps to keep your shots crisp and clear. On the downside, this is really not a camera best suited to sports and action photography, offering a rather measly 4.4fps shooting, but for landscapes, portraits, macro, and anything else that keeps generally still, it comes recommended. The 5D line of Canon professional cameras has long been respected and with good reason. The latest iteration of the successful model brings with it all the respected features of its predecessors, but builds on it to result in one seriously impressive model. It has a 30.4 megapixel sensor, and has a new innovation in the form of “Dual Pixel RAW” which allows you to shift the focus ever so slightly after you’ve taken the shot. Ideal for weddings, portraits and commercial photography, the only let down of the 5D series is that it’s not particularly geared for action and high speed photography. For those type of photographers, take a look at the 1DX Mark IV - but be prepared to pay an extra premium for it. The majority of professional photographers use either Canon or Nikon models, but if you’re prepared to look outside traditional manufacturers you can actually find some extremely appealing alternatives. One such option is the Sony A99 II which boasts a 42.4 megapixel full-frame sensor and is ideal for a huge range of different subjects. Not only does the high resolution make it ideal for commercial and advertising work, but it’s also got a fast frame rate which means you can use it for sports and action photography. There’s also 4K video recording and an adjustable LCD screen. While some people don’t like electronic viewfinders, it’s necessary here as the A99 II uses a translucent mirror design that can’t facilitate an optical viewfinder - but don’t worry too much, it’s really a very good one. The biggest downside to this camera is a limited battery life - so make sure you stock up on spares. It took Canon five years to bring us an upgrade to its entry-level full-framer, during which time the camera market was almost unrecognisable, with more compact system cameras (including full-frame models) than ever before. Never-the-less, for those who like to stick to the tried and tested way of doing things, the 6D Mark II is a good option for those looking for their first full-frame DSLR. You get a 26.2 megapixel full-frame sensor, a much-improved AF system (when compared to the original 6D) and an articulating touch-sensitive screen. There are some things which seem to be lacking for a modern camera, such as 4K video, but if you’re more into your stills than your movies, you may not be overly bothered by that. This is not a particularly exciting model, but it performs well in a good range of situations and being compatible with a huge range of optics makes it a good choice for those firmly fixed on the idea of the DSLR.